We are always pleased to share our homeowners’ reviews and recommendations for Windmill Homes and Improvements, Class A, BBB-A+ rated builder and contractor for the greater Richmond and Williamsburg, Virginia, areas! We are proud to have installed new kitchens, bathrooms, cabinets, roofing, siding, flooring, and room additions for our local homeowners. Home remodeling projects, sunrooms, and garage makeovers are our specialty! 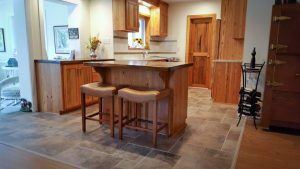 Please contact us if you would like us to add your review of our Nu Kitchens & Baths home addition, kitchen or bath remodeling project, roofing or flooring job. Rodney redesigned our entire Master Bathroom. He made the dream that I have had for almost 10 years come true! The bathroom is beautiful and working with Rodney was a wonderful experience! He made the renovation as painless as possible and left with everything looking absolutely perfect! He was always so open to listening to any of my questions and very patient with me when I made changes! His knowledge and experience made the whole experience very pleasant! We would recommend Windmill Homes and Improvements to anyone who needs renovation work. They were very professional and easy to work with. Our total bathroom renovation took about 3 weeks and the outcome was amazing! Thanks Rodney and all of his crew! We Love our New Bathroom!! Rodney, just wanted to let you know that it was a great pleasure to work with you on my bathroom project. A total bathroom redo in 4 days was beyond believing, but your crew came in, did what they needed to do, and were out in no time (taking all debris with them). It was like a well orchestrated dance. In this day and age, it’s hard to find someone who really cares about the job they do instead of how much money they can get out of you. You made sure I was happy with every step of the process. You and all the other people who worked on my bathroom project were always polite and very professional. Everyone showed up when they were supposed to, and completed the task at hand. What an awesome crew you have. I can’t express how pleased I am with the finished project. It far exceeded my vision. If and when I have any additional work that needs to be done, I won’t hesitate to give you a call. You’ve earned my trust. Great job and thanks again! We had a new roof and siding installed, along with shutters and a couple of doors and windows. Rodney proved to be exceptionally knowledgeable contractor in addressing the concerns of a slowly deteriorating home exterior. His professionalism was further demonstrated through his team of subcontractors, who were exceptionally skilled and courteous. Integrity and pride is apparent in the craftsmanship and finishing (thanks, Tony!). We won’t hesitate to hire Windmill for our next project. I recently became a caregiver, adding another member of our family to the household. While we loved our existing home, which was built by Windmill Homes and Improvements, I found that we needed more space. So who better to call than Windmill? We met with Rodney McNew about an addition to our home. He was very helpful in working with our budget and was even able to connect us with a company that could provide us with the financing we needed to make this dream a reality. The addition was completed in a timely fashion with quality workmanship. I would certainly call Windmill in the future if I am in need of further renovations and would recommend his services to anyone interested in making home improvement projects. I was most pleased with the renovation Windmill Building Corp did for me. My project involved a gracious old two story brick cape home in a very nice neighborhood. Mr. McNew took lots of time with me to find out exactly what I wanted and drew up professional plans for a step by step progression of the project including exact pricing and a time frame, which he not only stuck to, but beat by a couple weeks. Mr. McNew saw to it that the floors and stairs were properly protected and walls not damaged. He was on the job coordinating and overseeing everything from the first day on and making sure I was happy with every detail. My expectations were far exceeded. Friends and relatives have been in awe at the beauty of my new addition and how it all seamlessly fits in with my house. Windmill saw to it also that the grounds around my home were undamaged and any construction debris was completely removed. Every aspect of their operation was great. I highly recommend Windmill Building Corp. and they would for sure be my first and only choice for future building projects. Thank you for such dedicated workmanship. We love the new addition to our home and appreciated all of your recommendations to make it a success. It is obvious that you genuinely care about your clients and strive to meet their needs in the best manner. Everyone was very knowledgeable in their area of expertise.We would recommend you to anyone for any home additions or improvements. Again, we thank you for making our dream come true. My husband and I contacted Windmill about building a detached two car garage. Our past experience with contractors was not pleasant but we immediately felt comfortable with Rodney. Everything was well coordinated and builders showed up every day on time. They worked hard and kept the work area extremely neat. They had pride in their work and the final products showed it. The best part is that the work was finished ahead of estimate. I would feel comfortable recommending Windmill for any building projects. If quality construction is what you’re looking for in a general contractor then I would like to take this opportunity to recommend Rodney McNew, of Windmill Homes to build your next home. I can honestly say that Mr. McNew has been by far the most competent home builder I have had the pleasure of dealing with. His attention to detail and customer service is unsurpassed. Moreover, his sense of fairness and honesty is what we liked most. He also built our daughter a new home and we are pleased to give him our highest endorsement and would not hesitate to have him build our next home. When my husband and I decided it was time to retire to Florida, we were overwhelmed with all the work that needed to be done to our home in Williamsburg to make it market ready and ensure a good return on our investment. Thanks to Rodney’s can-do attitude and dedication to our tight timeline, our home was beautiful – ahead of schedule. Everything from granite counter tops, bath cabinets, entire interior re-painting, window and door replacement to landscaping (to name a few) – were completed professionally and with minimal impact on our day-to-day lives. We recommend Windmill Homes to anyone needing a home improvement professional. After several years of looking for a reliable company to put in granite counter tops in my kitchen, found Rodney at Windmill. I went to their showroom in Providence Forge and chose the granite I wanted. Merri went out of her way to make sure I found what I was looking for. Rodney came out and made sure things went smoothly. If I need any other work done in my home I will be contacting this company again! I am very happy with the work that was done. When we decided to update our kitchen, we did not have the slightest idea how or by whom or how much it would cost. Windmill Homes is nearby and was only one of several places we checked out. Merri was great … leading us through the renovation process and showing me countertop alternatives. When Rodney McNew came out to the house he knew right away what we needed to get a newer look without breaking the bank. They were able to start the renovation project earlier than planned. We always knew when to expect the work crews, who were polite, quiet, and efficient. And they cleaned up after themselves! We made a last minute change which didn’t phase them a bit. Mr. McNew came out each day to make sure the work was taking place properly. He called after everything was done to make sure we were happy with the work. And we were!! Very Happy! Best of all: my sisters are jealous!! We definitely, and without reservation, recommend Windmill Home Improvements for your home renovation needs. Thank you so much, WHI! Nu Kitchens & Baths by Windmill Homes and Improvements, led by owner Rodney McNew and supported by Office Manager Merri Gresch, provided a truly outstanding customer experience throughout our recent bathroom remodeling project. From the initial consultation and design, to product selections, planning, scheduling, site preparation, and the execution of the work, we were in the very best of hands. Professionalism, timely and highly reliable communications, hands-on direction ofthe various crafts, and a personal commitment by Rodney McNew to our satisfaction with the work as it progressed, defined the quality of this outstanding Company. Based on our experience, we found that Nu Kitchens & Baths by Windmill Homes and Improvements consistently under-promises and over-delivers, provided superior work and personal attention to their Customers, and we highly recommend them to anyone. If you need anything done in your house Nu Kitchens and Baths is the team to have. Moving from out of state I had no idea who could help me turn a dated 1970’s house into my dream home. Then I was referred to Rodney and Nu Kitchens & Baths by Windmill Homes and Improvements. Best choice ever! My remodel started with gutting the kitchen and with their help it is now beautiful and functional. I ended up adding bathrooms, painting and a front hall redo, including door, floor and railings – all which turned out gorgeous. Through this all Rodney and his team didn’t miss a beat. The entire project finished on schedule. I couldn’t be happier with how my “new” house looks and works. If I ever come up with new projects this is the only company I will ever go with. Many thanks to Rodney, Merri and the entire team for giving me my dream home! 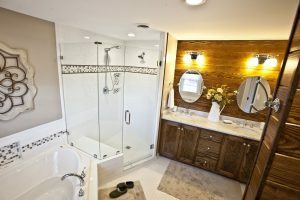 We hired Nu Kitchens & Baths by Windmill Homes to renovate our master bathroom. 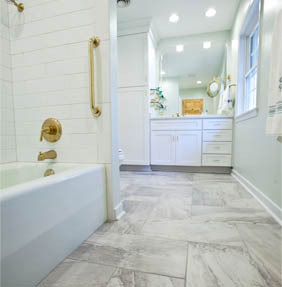 When we started the renovation we found that we had had a major leak that had ruined the subflooring in our master bathroom, master closet and the additional full bathroom in our hallway. Our master bathroom renovation turned into a major renovation! Rodney and his crew were wonderful! They were able to get all the damaged flooring replaced and get our hall bathroom and master bathroom finished on schedule. Our bathrooms both look beautiful and you can tell it is quality work. Rodney made sure that everything was done just the way we wanted! We would highly recommend Nu Kitchens & Baths to anyone who is thinking of redoing their kitchen or bath. We tasked Windmill Homes & Improvements with finishing our basement in Brickshire. The project was kept on schedule-start date to end date. It even ended a little ahead of schedule. All the contractors were very professional, knew their craft, provided ideas for us, were patient with us, and were very friendly and pleasant. If something didn’t meet with our approval they were eager to please and fixed the issue. They kept out of our way were not noisy or bothersome. They worked in our basement for 3 months and at the end I was sad to see them leave. We are so happy with how our finished basement turned out. I would highly recommend Windmill Homes & Improvements-Nu Kitchens & Baths. Mr. & Mrs. R. C.
Nu Kitchens & Baths invites you to stop in and visit our showroom during business hours, or to contact us for more information.